Yorkshire Terriers are fun-filled homebodies for most dog owners. With the holidays quickly approaching, you may wish to go somewhere and want or need to take your Yorkshire Terrier along on your trip. But if you must travel with your Yorkshire Terrier, here are some important thing you need to know. Yorkie travel can be tricky, however if you know what to do you will be OK. If you take out quality time for preparation, traveling with your Yorkie can be an adventure for both of you and also quite a rewarding experience. A lot of travel agents are now used to assisting people with travel arrangements and provision for their dogs. Be sure to tell them that you will be traveling with your Yorkie so that they understand it is a very small dog who will be your travel companion. So many hotels and even motels now accept dogs. But be sure that the DO NOT DISTURB sign is on the door while you are gone if you must leave your Yorkie alone in the room. This will prevent the possibility of the manager or housekeeping opening the door thereby frightening your dog or letting him out accidentally. Ensure you bring your pet’s bed and his favorite toy so that he can feel more at home while you are on your trip. Before you travel with your Yorkshire Terrier, you must make sure you take him to go and see your veterinarian. Tell your vet to help you make some recommendations for your Yorkie’s wellbeing and also tell him where you will be going to and what your plans are. Make sure that all your dog’s vaccinations are up to date and that you have a comprehensive printed copy of their shot record. This depends on where you are going. You may need a health certificate or proof of an up to date rabies vaccination. 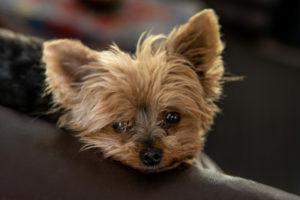 Sadly, some Yorkies end up separated from their owners when traveling, the best way to prevent this is to implant a microchip in your Yorkie for easy identification if they get separated from you while you are traveling. While traveling by airplane, make advanced reservations to ensure your Yorkie is safe. Your Yorkie can travel in a small soft-sided carry which fits right under your seat on the plane. Your Yorkie might be sent to the cargo area if he travels alone. Yorkies hate it when you are gone for a long period as a result of your frequent traveling. Before your next trip, take a record of the number of days you will be away, and watch the response of your Yorkie when you return. They often don’t understand why their human caretakers will leave them at all and tend to show it in bizarre ways. So, it is up to you to take on the responsibility to ensure that as a Yorkie owner you show him respect and lots of reassurance that he is safe and secure at all times. This is one of the secrets to your pet’s happiness. Play fetch, take a walk or move around the neighborhood. This will make him feel more relaxed during the travel period.